One of the critical features in the business strategy of McDonald’s is a marketing strategy that puts emphasis on maintaining prominence in the global market. The success of this fast-food company can partially be attributed to its specific marketing principles and activities that have made it an iconic American brand. Large corporations involved in delivering products or services to mass consumers have invested heavily in advertising and Sponsorship. Nonetheless, similar to prominent global business organizations such as the food and beverage manufacturer The Coca-Cola Company and the footwear and sports apparel manufacturer Nike Inc., McDonald’s have also invested on developing and disseminating advertisements using different mediums, as well as in sponsorships through brand partnerships and celebrity endorsements. Across different geographic markets, the fast-food company has rolled out advertising campaigns with themes based on specific occasions and cultural dispositions of the geographic target audience using traditional mediums of communication such as television and print, as well as outdoor displays and mediums or platforms used in digital marketing activities. It has also developed advertising campaigns specifically for children and their parents. The company has also sponsored sporting events such as the Olympics Games, the FIFA World Cup, and the Little League Baseball and Softball. In specific geographic markets, it has utilized local celebrities in the fields of television and film, pop music, and sports as its brand endorsers to tap the fan base of prominent local personalities and appeal to the local audience. Integral to the marketing strategy of McDonald’s is a conscious effort to remain appealing to children. Remember that it has developed advertising campaigns and rolled out marketing messages for the younger audience. The rationale behind this specific marketing tactic centers on the need to promote the fast-food company as a child-friendly and family-friendly restaurant. Appealing to children would also mean appealing to their parents and their entire families. However, aside from advertising, McDonald’s has employed other marketing tactics to remain appealing to children. 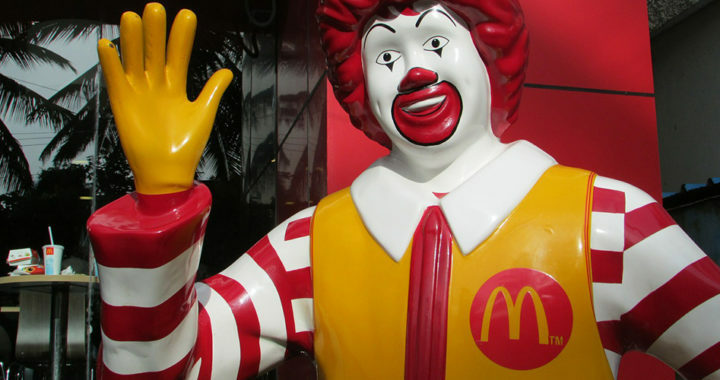 For example, it has introduced Ronald McDonald and other mascots to symbolize its playfulness and child-friendliness. The company has also attached playgrounds or playpens to almost all of its restaurants to invite families and make the dining experience child-oriented. The Happy Meal branding also demonstrates an effort to appeal to children through a specific product strategy. Through this sales promotion tactic, McDonald’s has not only developed menus for children but has also partnered with toy manufacturers or merchandise producers to sell both food and toys. Each order of a Happy Meal comes with a collectible toy that is often associated with a current trend and upcoming or ongoing movie for children. McDonald’s is an American brand and it symbolizes not only the global influence of the United States but also the American way of life. The company offers American-based or diner-style fast food items such as burgers, fries, and chicken. However, in certain countries, restaurants have menus that offer a fusion between American and local cuisines. In Japan, for example, McDonald’s has developed food products that have elements of Japanese cuisine. Examples include the varieties of burger items such as the teriyaki and korokke burger. In the Philippines, the restaurants offer rice along with chicken and sweet-tasting spaghetti that are not present in Western-based McDonald’s restaurants. Localization is a product strategy that allows the fast-food company to appeal to the unique food preferences of the local target markets. It also enables McDonald’s to compete against local fast-food restaurants. For instance, in the Philippines, offering rice and spaghetti in the menu demonstrate competition with the local rival Jollibee Foods Corporation. Another element in the marketing strategy of McDonald’s is franchising. Although it also serves as a business model, franchising has enabled the fast-food company to enter a foreign market and thus, has allowed it to expand its operation across the globe. In other words, the practice is also an internationalization strategy and a mode of entry. Franchising essentially enables an organization to create a network of independent business operators in a particular regional market or the entire global market. These operators or franchisees are responsible for running their own businesses but they also collectively serve as a distribution channel for delivering quality-controlled products to the target market. The fast food concept and the overall operational efficiency observed in different branches have attracted the attention of investors and the restaurant industry. Note that the company generates some its revenues from the rent, royalties, and fees paid by the franchisees. However, despite these costs, franchisees are assured with a high return on their investments. A corporate social responsibility or CSR program signifies not only the philanthropic values of a business organization but also its attempt to promote or improve its public image. In other words, a CSR also serves as a component of marketing strategy because of the positive publicity it provides. It is worth mentioning that McDonald’s has been criticized for promoting unhealthy eating habits. Its entire brand has been associated with the obesity pandemic in the United States. The fast-food company has also been accused of unethical practices linked to the way it processes its food products. Nevertheless, McDonald’s has developed and deployed various CSR programs aimed at responding to these criticisms and promoting its corporate image. The company has established the Ronald McDonald House Charities with stated goals and objectives of improving the health and well-being of children. It has also partnered with other organizations through donations and direct participation for staging sporting events, raising health awareness related to proper nutrition, and promoting responsible farming, among others.